We’ve examined in recent essays attitudes to the pub from the 1930s-1970s, coming from Irish, Irish-American, and English quarters. The general picture, the odd dissenting note apart, is of a venerable and benign institution, entirely characteristic of its native lands, fostering community, mirth, and maybe song. Pubs were noted as well for architectural and historical features, and for accommodating a wider demographic than before WW I, especially women. Increasingly too the drinks typical of the pub came in for attention, beer of course but also cider. By the mid-1950s, the pubs and the way people wrote about them are recognizably modern. Soon, university scholars would follow to add their ponderings. I’m setting aside periodic reports of health departments and recurring news campaigns about the dangers of drinking. These spring from a wider concern, with alcohol’s abuse in general. The pub is one facet, but hardly exhaustive. Writ large, the picture is sylvan, reassuring. There’s a tavern in the town, there’s a place where everybody knows your name, and (often) one more for the road. What’s not to like? Except, it wasn’t that way before WW I, as discussed in my earlier posts, not in official or polite society, call it what you will. Even the first modern writer on the pub, Ernest Selley, born in the 1880s, was warned by his parents against entering such establishments according to Ben Clarke’s article I discussed recently. Much evidence abounds on the (at best) equivocal image the pub evoked in Victorian opinion, as analyzed too by scholars such as David Gutzke and Paul Jennings. (In saying this, I take no position for or against. I’m outlining various historical positions, from different quarters, so people can think about where the truth lies, as I do continually). If we look at writing in the U.S. press on the British pub between Reconstruction and the 1930s, broadly a similar pattern emerges. Early stories are often carping, as were similar accounts of the American barroom. At most American writers were guarded, considering the pub not quite of social repute although run by respectable people for the most part. By the 1920s and especially with the expiry of National Prohibition, the Stateside tone changes to one of frank admiration. The pub adopts a gilded aspect, hallowed by age, tradition, and (oddly) British gentility. I’ll look at a number of these accounts, starting with this one of July 27, 1880, from the Watertown Times in Watertown, NY. It is a letter to the editor although longer than most such pennings. The story at least today rings uneasily to our ears due to its strident tone. It is anti-pub, anti-drink, anti-Yorkshire, anti-British. In a word, full of bile motivated by some obscure discontent. Still, it’s a picture of one small-town Victorian pub by one visitor, an inn but of no elevated distinction. In fact, the (anonymous) writer uses the term pub except placing it in quotes. Of interest is his description of three separate rooms, meant he said to attract respectively, the average tippler; moderate drinkers who wanted amenities such as cushioned seating and wall decor; and young men and women with a piano for entertainment. Landlord Gott is portrayed as self-important and prolix on politics, with his customers as awe-struck audience. His wife, Mrs. Gott, fusses over and is familiar with customers including the priggish writer, to his annoyance. The walls [of the second room] are hung with dull smoky-looking oil paintings of mail-clad knights and convivial scenes, and perhaps here and there a faded, a very faded view of some moonlight with a background of weird ruins. The third room is across the corridor at the end of a very long passage, and by a merciful dispensation of providence, the piano is placed off in there. This room is frequented mostly by young sprigs and their girls, and the contortions that the piano goes through and the shrieks that issue from it are heartrending. Let me be bored to death by listening to discussions upon the subject of “Owd Billy Filigree’s eccen­tricities,” or the drunken exploits of a warlike Briton with the stiletto, and my endurance is great. Let me breathe sec­ond-handed the perfume of beer and be turned to a herring tint by tobacco smoke, and I survive. Let me be any­thing, but, 0 don’t condemn me to “The Maiden’s Prayer,” or H.M.S. Pinafore, or any of those rare old gems of song, those pearls of minstrelsy. Let me die in peace. The vitriol is hard to take, certainly. The writer seems actuated, not by religious motives, but simply the sense that drinking was a waste of time and prevented resources from going to more useful purposes. He mentions in particular the lack of free schooling in England (although I believe it existed by then in Scotland). The link between these two situations is surely questionable though, and in any case his opinion is elitist. The more prosperous classes have never abjured alcohol in the service of yet further elevated goals in life. He sardonically comments on the books used in the (non-free, he says) state schools which included a manual on surgeons. He comments on the utility of the latter given all the wars Britain fights. A strange thing to read with the calamitous American Civil War only 15 years behind and the nasty Spanish-American War, not too far ahead. So, a piece of limited but decided interest. And it must be said the portrait of a young inebriate in the bar is not pleasant to contemplate: a scene of Dickensian grimness if there was one. The tone was slanted, very, but such accounts should not be dismissed for all that. Nota bene. Of three notable things about this article, the pub, the newspaper it appeared in, and the writer, two still exist: the paper and pub. 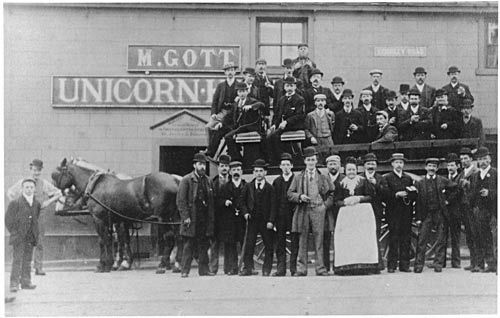 The Unicorn is still going strong in Skipton, as its website and other sources confirm. And images on the site show that the Gotts did run the establishment in the late-1800s. Due to the widening of Keighley Road on which the original building stood, the pub was rebuilt near to the original site. Today it is a hotel only, the pub on the ground floor was given up although not all that long ago, within the last generation. (The image above was drawn from the current website). Hence, the institutions that hosted the dyspeptic American long outlasted him, and no less the small-minded attitudes he incarnated. Finally, I proffer an affecting bluegrass performance of The Maiden’s Prayer. By Americans. The best way to introduce Duff to you viz. English pubs is to read him for yourself. I’ll keep the comments to a minimum. Probably strategically he chose the regional-based cider as a gastronomic subject vs. the ubiquitous beer, and devotes three pages to the Devon variety. Unlike many today, he did not fancy the “rough” (probably Brettanomyces-tinged) darkish farmhouse type and preferred a light sweet cider. In this period, early-1950s, cider was, or so he says, untaxed, therefore variable in alcohol strength – it sounds the picture of the artisan product but available in different qualities. Contrary to intuition, he quotes a local as saying cider is better now than it used to be – no misty Celtic romance here. We are not quite in the craft mindset yet, in other words. He was impressed with how locals drank it – wisely, not getting off their head. It’s part of a picture of sane usage of drink encoded in the folk ethos, and quite different from the typical Victorian portrait as I discussed in the previous essay. Hence, for cider with Charlie, see pp. 276-278. For beer, he focus on pubs north of London and somewhat easterly (Herts and adjoining areas), you can read the account at pp. 310-312. Although focusing on this geographical area he states that pubs in most parts of England are similar. He remarks mainly on architectural and historical features although in one instance mentioning the high quality of a tenant’s beer. The main emphasis is on fellowship, community, and tradition – values numerous mid-century writers found in pub culture albeit invisible to most of their 19th-century counterparts, again. He speaks of the pub as a valued centre for local people, in effect the common man’s club Ben Clarke wrote about as I discussed in Part I. He eulogizes the pub as perhaps the most characteristic institution of the English, high praise indeed, and an insight beer author Michael Jackson also expressed in his 1976 The English Pub. Duff also foresees, in effect campaigns for, the full opening of the pub to women, including the country pub. He deprecates the old tradition of keeping them out of drinking places, “Puritan” he calls it. Here he shows the progressive nature of post-1920s British social studies, a trend only accelerated since in society. Perhaps he lacks quite the feel for English pubs than he demonstrated for Irish ones, but that would be natural given his birthplace and upbringing. All in all, the way he writes about pubs and drink could be published today, almost as is. In the main, after 1945 the pub had arrived. How could Ulster-born Charles Duff write on Irish and English pubs in the engaging way he did in the 1950s? I discussed his Irish observations here. His English notes are set out in his book England and English (1954), which I’ll discuss below. By “how could he” I mean, given the 19th century and Edwardian stances on the evils or at best dubious value of public houses, how could a sophisticated writer expatiate brightly c.1950? By the early Victorian period … inns and pubs lost not only their respectable clientele but their own respectability. Their limited but loyal clientele was primarily working class in composition, supplemented by a small, lower middle-class contingent. As a contemporary illustration of this view, one of many I could offer, take Charles Black, an earlier, guide book writer. In an 1861 survey of England’s southeastern counties he refers to public houses and “beer shops” as characteristic of “squalid” and “miry” districts. He recommends not a single pub to visit. Occasionally he notes approvingly a detail of pub history or makes another point of interest, but never mentions the beer, a sina qua non of the pub. See e.g. p. 644. True, Black speaks of the inn differently but we must remember the inn was what the name suggests – it offered accommodation to travellers. Hence, it was a necessity for the traveller, Black’s prime audience. The inn therefore had a higher status than the alehouse turned beer house turned public house. (See Boak and Bailey’s 2017 study, 20th Century Pub, pp. 11–19, for a conspectus of the terms pub, tavern, and inn, viewed historically). In this respect, too, I am speaking not of learned or historical studies of taverns, inns, pubs, and beer, or trade or legal manuals for a specialized audience, but writing meant for a broad readership. Popular history and guidebooks are perfect examples, and Duff and Black excelled in these genres. In his 2016 A History of Drink and the English, 1500-2000 Paul Jennings explains the wellsprings of views such as Charles Black’s. Jennings chronicles the Victorian rise of the notion of respectability, both in middle class and working class populations. The idea entailed a deep mistrust of the public house founded on a concern that excess alcohol use invited dissipation, violence, and family break-up. The pub’s equivocal, at best, standing in public opinion contributed to a long-term decline in the number of pubs by the 1900s. This was exacerbated by the sharp price increases and reduced quality of beer during WW I. Even the pubs’ natural constituency, working people, devised another communal drinking option: the workingmens’ clubs. They arose to address what was seen as the same “respectability” problem. As Jennings explains, the club concept ensured that strangers and passers-by could be kept out and a level of peace and civility maintained that evidently was outside the capability of the typical public house. The club trend was partly arrested by the “pub improvement” scheme of the inter-war years, to which both brewers and social planners were committed, and by WW II itself. In contrast to WW I, WW II was viewed as justifying the reasonable use of pubs. The blitzing of London probably helped this trend along, the civilian’s counterpart to the rum keg of WW I trenches. * The second war also expanded use of pubs by women. See again Boak and Bailey on these topics. Then too, mores simply evolve. Public morality after WW I had undergone significant changes due to the onset of industrial capitalism, the profound social toll of modern warfare, and the effects of film, radio, and finally television. This is the general background, to simplify a complex topic, to Charles Duff’s benign view of pubs in the mid-1950s. Duff wasn’t the first person to write this way, to be sure. Fellow Irishman Maurice Gorham authored, in 1939, The Local, a book-length study of the London pub in all its diversity from soup to nuts. Briton Ernest Selley in 1927 wrote The English Public House as it Is. One thinks too of George Orwell’s famous 1946 reverie on the ideal pub, The Moon Under Water. These influential writings portrayed the pub, quotidian as it seemed to some but quasi-licit still for many, especially the Church, as a valid subject for popular interest. Notably, this new coverage eschewed the heavy moral overtones of pub commentary in the later 1800s. Hence, a new tone entered public discourse. In a Spectator review of Selley’s book the reviewer wrote that before Selley “no one …had made a comprehensive survey of English public-houses”. 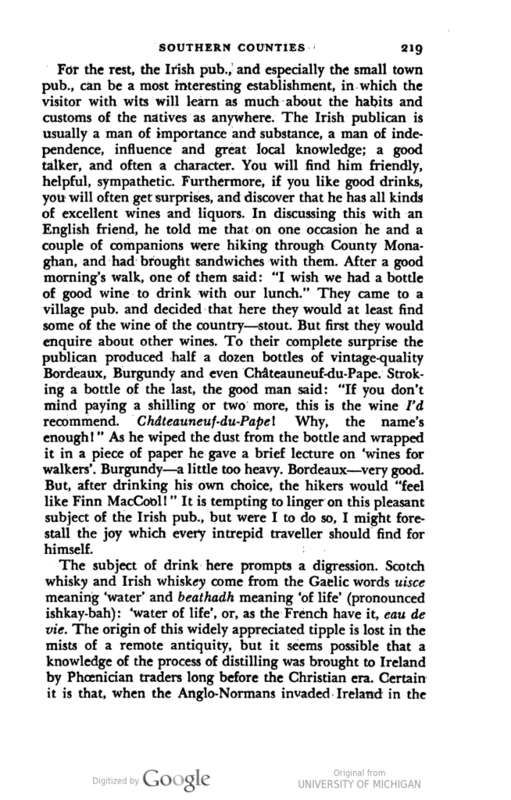 The reviewer pointed out the popular nature of Selley’s inquiry – that he wrote about pubs as “an ordinary customer”. Is this, then, what we have to explain how Gorham, Duff et al. could write about pubs in a way quite different to the Victorians – in a way rather similar to today, in fact? I felt it wasn’t that simple, but had difficulty identifying the key missing factor(s). At first I thought that 20th-century London, and modern urbanization in general, marked a bright line from the Victorian period. The argument would run that by 1939 the public house was fundamentally different in Dublin, London, Edinburgh, and New York to the pub as known in rural enclaves. For one thing, patronizing a pub was hardly an anonymous act en province, as against the fragmented, increasingly anonymous city. In this way of looking at it, the pub of country vales remained a male redoubt, with continued working class/artisan/farmer patronage, while the big city bar became a different institution, frequented as it was by a variety of social classes, offering meals at least in daytime, and increasingly open to women. The urban-rural divide was probably a factor, with the others noted, in the “moral” re-evaluation of the pub, yet there has always been continual movement from province to metropole, in both directions. Many live in bedroom suburbs but work in large cities, and so have a hand in both worlds. Commuter suburbs were well-established by the 1930s. Anyway, national social and cultural traits evolve over centuries and don’t turn on a dime. Enter Ben Clarke’s 2012 article, “‘The Poor Man’s Club’: The Middle Classes, the Public House, and the Idea of Community in the Nineteen-Thirties”. It provided the flash of insight I needed. The article was published in the University of Manitoba’s journal Mosaic: an Interdisciplinary Critical Journal. It is behind a paywall at this time but is available on JSTOR for those who have access. Ben Clarke is Associate Professor of 20th-century British literature and critical theory at the University of North Carolina. He holds both doctoral and undergraduate degrees from Oxford University and almost certainly was raised in Britain. Clarke argues that a group of mid-1900s writers idealized the pub, indeed created “myths and fantasies” around it. The pub beckoned to them as an alternative to what they perceived as the relentless individualism modern capitalism favours. These writers posited a desirable community of workers and artists as exemplified by their pub, a quality the middle classes had tragically lost by the mid-1900s. For many middle-class writers and intellectuals in the nineteen-thirties, such as George Orwell and those who worked for the radical social research organization Mass-Observation, the pub seemed to provide a point of contact with the class which, Marx and Engels famously insisted in the “manifesto of the Communist Party”, “holds the future in its hands” (10), a place to, as Cecil Day argued in his “Letter to a Young Revolutionary”, investigate the “temper of the people”. (41). At least as importantly, it promised entrance to communities that offered a positive alternative to fragmented, anonymous middle-class life under advanced capitalism … It was the site of independent working class organizations from political groups to saving clubs, but also of less formal relationships sustained though communal practices, from singing to the buying of rounds, which reinforced broader solidarities. In a society which, Marx and Engels insisted, recognizes “no other bond between one man and another than naked self-interest, unfeeling ‘hard cash’” (3), public houses seemed to support authentic communities that could not be reduced to expressions of rational self-interest, though in practice access to them often depended upon having at least the price of a drink. In order to focus on this social function, writers challenged images of the pub as the site of drunkenness, dissipation, and violence that had gathered force in the late nineteenth century and persisted into twentieth. [Clarke’s] … essay analyzes the ways in which interwar writers such as Hamilton, Hampson, Massingham, Orwell, and those involved with Mass-Observation rewrote Victorian ideas of pubs as the products of personal failure, figuring them instead as communal centres. It explores images of the public house as a refuge from advanced capitalism and the social functions it actually served. In discussing interwar fictional representations of the pub Clarke shows how the authors’ protagonists and, by extension, the writers (including George Orwell) sought this community. They did so to counter what they saw as the anomie of middle class life, centred as it was on competitive economic performance. Clarke explains these artists nonetheless were continually disappointed in this quest. This was not so much because the public house did not provide the sought-after community but because the writers could not negotiate the codes and manners of the coteries they admired. Clarke also makes the point that cohesive-seeming pubs were as much a part of capitalist organization as a response to it, a “negotiated” position in the system, he calls it. These are superb insights on his part. Orwell and Duff in particular exhibited an anti-fascist spirit and independence of mind that reflected some sympathy with left-wing ideals. It led them to empathize with persons and resorts not typical of their social class, but arguably some romanticization set in. Clarke considers the influential social-research group Mass Observation and its books on the pub to be actuated by the same motives as the writers he profiles. Certainly, Orwell yearned for a greater sense of community, which he viewed as declining in Britain. In 1943 he reviewed the book The pub and the People issued by Mass Observation, and noted that people were withdrawing from community due to the drug-like blandishments of modern entertainments. Orwell’s 1946 essay The Moon Under Water posits the ideal pub. The reality was rather otherwise as he well implied but his ideal represented an acme of the community experience. Of course too his famousnovels 1984 and Animal Farm posit examples of false community, of community exploited by cynical, false messiahs. 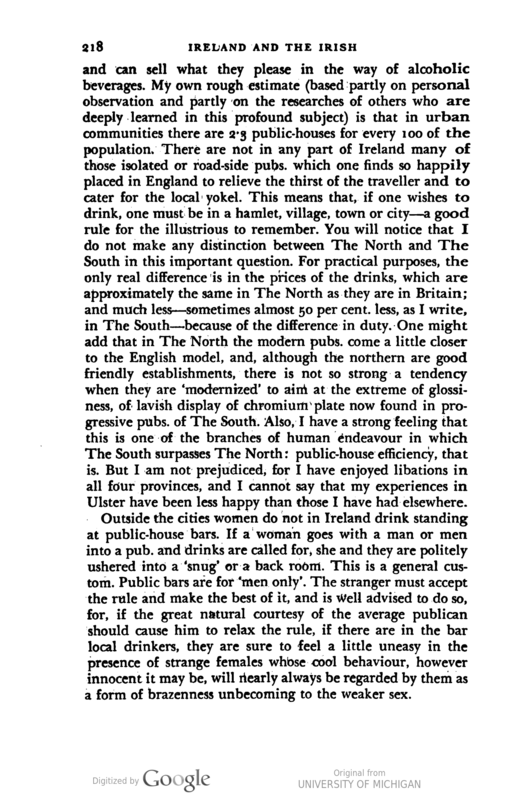 In regard to Charles Duff, one thinks of his expressed preference for the Irish working man’s pub vs. the more inhibited, soigné pubs with posh clienteles. This fits in with Clarke’s thesis even though Clarke does not mention Duff or Maurice Gorham (he does however cite Ernest Selley’s book). Clarke was concerned mainly with a different kind of literature but mid-1900s consumer writing on beer and pubs illustrates his thesis well. Of course as for any theory, some limitations suggest themselves. it is mother wit that a glass of beer with friends or equable companions, in informal, pleasant surroundings, can be a welcome diversion from the frazzles of modern life. Also, artists and writers typically are not big earners and regardless of social class seek diversion in establishments they can afford. One thinks of Sigmund Freud’s dictum (apocryphal?) that sometimes a good cigar is just a cigar. This notion of the centrality of the English pub has been shared by many popular writers who have written at length on such topics as pub signs, pub entertainment, pub food, pub beer and pub architecture. In discussing these diverse aspects, many writers have noted the uniqueness and peculiarity of this English institution. Hunt and Saterlee then quote beer critic Michael Jackson (1942-2007), a journalist turned beer writer who left school at 16. Jackson wrote in his 1976 The English Pub that the pub is unique because “it is an organic part of the growth of English life”. By 1986 pub appreciation had evidently gained a permanent, general British audience. The pub had entered a different phase: that of modern leisure pursuit. The pub, whatever the reality of its stock-in-trade and whatever view one takes of its net contribution to society, became, and remains, respectable. But looking back to writers such as George Orwell and the others considered by Ben Clarke, and as well in my estimation Charles Duff and Maurice Gorham, Clarke provides a key explanation how the latter could write what they did, when they did. … in spite of the pub’s long tradition as an important component of social life in England, it would appear that contemporary social science research in Britain has to a large extent neglected to investigate its present role. This lack of interest both by sociology and anthropology is even more surprising, given the interest in community studies in Britain in the 1950s and 1960s and the development of leisure studies as an important area of investigation in the 1970s. Whatever the reasons are for this neglect – and one writer has even suggested that one of the reasons may be that sociologists, like temperance men, are seldom pub-goers – we are nevertheless left with a tiny collection of social science literature which deals with the pub and its role within the community. We see here, I think, as late as 30 years ago, a murmur of the old establishment disapproval of the public house. Now, on to Duff and the English pub in 1954. See Part II. Note re article extracts: the quotations above are drawn from the articles identified and linked in the text. All intellectual property therein belongs solely to their lawful owners, as applicable. Extracts are used for educational and historical purposes and as fair comment. All feedback welcomed. *See a contemporary, journalistic validation of this view, discussed here. **I don’t claim that selling even tens of thousands of books worked a social revolution of itself. Yet, it is good to remember Shelley’s dictum that “poets are the unacknowledged legislators of the world”. Gorham and Duff, and Orwell and the other writers profiled by Clarke, portrayed the familiar old pub, at least at its best, as an inviting resort for all – in a word an institution. Those who read the books, or reviews of the books, would have been influenced accordingly, or they “told their friends”. The huge influence a Michael Jackson had on the early years of the modern beer revival was an analogue for his time. Put differently, successful writers punch above their weight, in such matters as countless others. Canadian Beer News provides the backstory to this latest release by the Scots brewers Innis & Gunn. We have written much of them and their innovations in the brewing world, not least here. 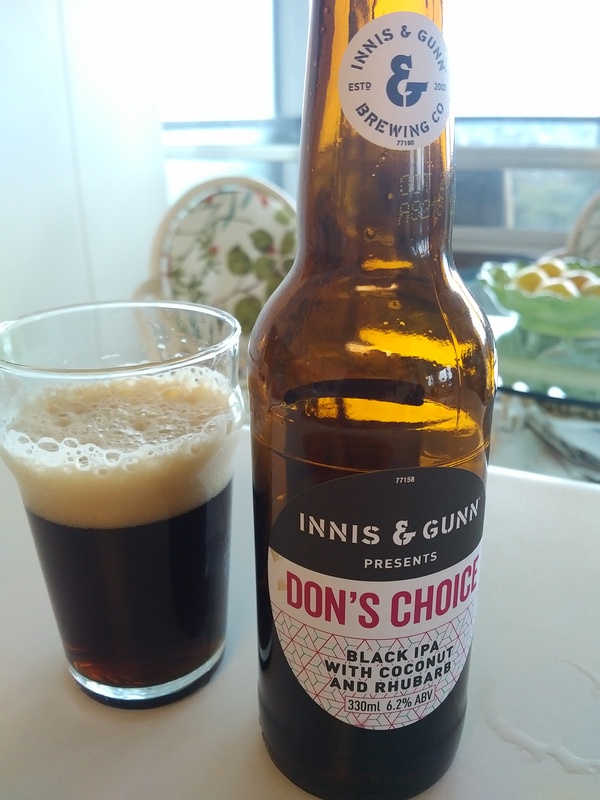 It’s a Black IPA devised in a “next beer” consumer competition for Canada by winner Don Guimond from New Brunswick. 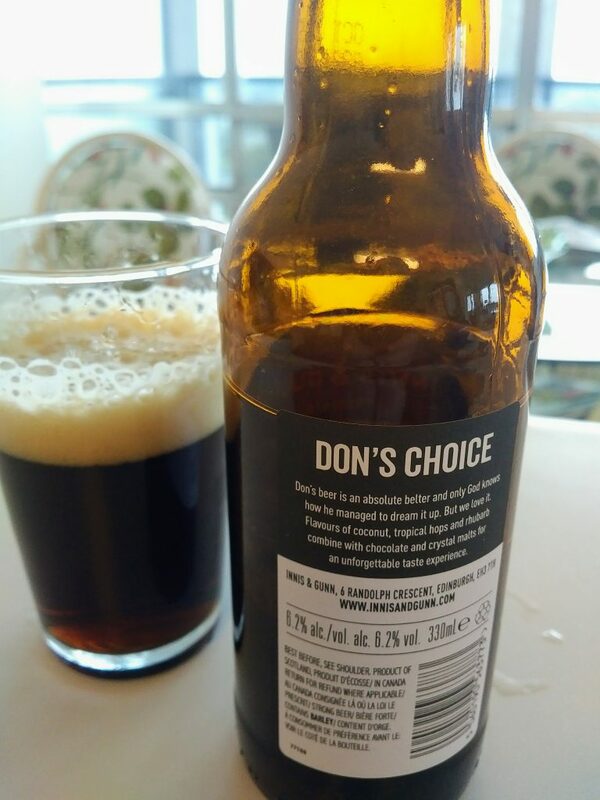 The full name: Don’s Choice Black IPA With Coconut and Rhubarb. (Acknowledgement: Beer et Seq entered the contest too, and, no surprise, I didn’t win! My recipe was simply, a double or Imperial stout made to 19th-century specifications, stored for a time in Memel or Baltic oak from Eastern Europe. As the idea is nestled in I & G records, we hope it will see light of day at some point). We are on I&G’s distribution list for beer writers, publicists, and similar, and a bottle was sent our way. It’s a delicious beer, and here is the point: whether you can taste coconut or rhubarb, which I could not, is neither here nor there. The point is, does the recipe make for an excellent beer? It does. It is malty-sweet, which I like, has notes of cocoa, and a New World hop accent that is more subtle than the sledgehammer which is the typical Black IPA. Dialled down? Perhaps, but it tastes great – it all depends, after all, what you feel about the “baseline”. To me the beer is rather like a good milk stout, or call it a late-19th-century mild ale if you like. It’s not really black in fact, but more a rich dark brown. Putting it another way, I’d guess good American porter, or brown stout if you will, was not dissimilar back in the day. There is no “musty vanillin” tang from American oak aging or treatment, a plus in my view. The label doesn’t claim oak aging so I’d think none was used. I’d like to try it on draft, one, in an English pint glass. Because it tastes traditional-British, finally, which is partly what makes it so good. In a Part I we cited milestones of the modern craft beer festival including the first national beer tasting, in Richmond, VA in 1859. 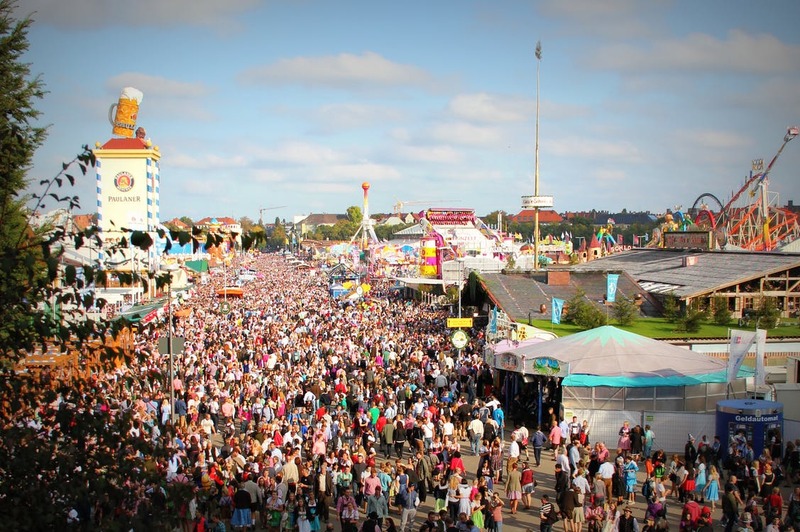 The age-old German beer festival with its related cultural expressions – folk music and dance, costumes, beer gardens, traditional foods and games – influenced the shape of pre-craft festivals. I discussed examples notably in America and Canada, but also in Ireland 1964-1973. At the same time, some early festivals demonstrated an “American” or deracinated character, especially large-scale ones. These events, billed to the general community, were a progenitor of the Great American Beer Festival (GABF), template for the modern craft festival. GABF’s first program in 1982 focused in great detail on varieties of beer and was de-anchored from an ethnic German context. The German Alps Festival held for many years at Hunter Mountain, NY in the Catskills, which included an “international beer exposition”, exhibited dual traits: secular-national and German-ethnic. The cultural tone was German but hang-gliding and falconry competitions, a flea market, a petting zoo for kids, and puppetry were also featured. The national and stylistic range of beers offered, and a show of beer memorabilia and cheese-tasting, also reflected the interests of a general American audience. If the event had been as traditionally held by a German restaurant or social organisation, there would be no need for a wide variety of American and international beers. A few standard American lagers and maybe a German import or two would suffice. Many examples can be shown of the “parochial”-type event, held continuously since German communities first appeared in North America. Indeed the Kitchener, ON Oktoberfest, while marketed far and wide, retains an ethnic character to a remarkable degree. This is due largely to the strength of German ethnic heritage in Kitchener-Waterloo underpinned by the large number of German clubs such as the Concordia Club. A good supply of Rheingold Golden Bock, Lowenbrau and other domestic and imported bock beer, is on hand to satisfy the thirst of its patrons. Music will be another feature from 7 to 11 p.m. each evening. Tangy Berliner Weisse (the craft “sour” of the time), hearty Bavarian double bock, incisive English pale ale, and diverse European blonde lagers were on parade at Hunter Mountain in 1977, years before the craft beer revolution started in earnest. Such a selection was not to be sneezed at, then or now. In addition, the pan-American range offered would have appealed to many, mostly from now-disappeared large and small breweries. In contrast, German-character fests showed no obsessive emphasis on beer, not in the sense we understand today where many different beer types, their origins, and detailed characteristics are set out in the event program. Pointillist interest in international beers including production characteristics and related cultural lore was largely absent until the craft beer era excepting only the most dedicated German restaurants such as Janssen’s and Luchow in New York (as I’ve chronicled earlier), and even then one sees this mostly before WW II. The pairing of a trade exhibition to consumer beer enjoyment is another “secular” marker, familiar at many large-scale beer fests today. The U.K. Campaign for Real Ale’s festivals have, to date, sedulously avoided the commercial angle. This lends a pleasing purity to the festivals while one wonders if the commercial viability could be enhanced by going the Full Monty. The 1933 American Beer Exposition in Cleveland was a combined trade fair and public tasting held at the Cleveland Public Auditorium. It attracted an astonishing 100,000 people from September 2-9 that year. There was a huge beer garden with German ethos equally evident in some entertainment and decor. Still, the event was also “American” or at least cross-cultural. For example, it also had “Parisian cafes”, and offered nationally-known musical attractions and “Barbary Coast” and other light entertainment. Beers from both “American” and “foreign” brewers were featured, not just local beers much less from one brewery as could typify the German-style fest. For the latter, beer is indispensable but in truth not the focus. The beer is taken for granted in a sense, a good sense, but not more. While not styled a beer festival, the “long bar” at the 1976 Vancouver, B.C. Habitat “peoples’ conference” I discussed in this post was a proto-beer and wine fest of the modern type. An effort had been made to secure a variety, not just of regional beers, but beers from Eastern Canada, as well as an import or two. At the time this was innovative in Canada. 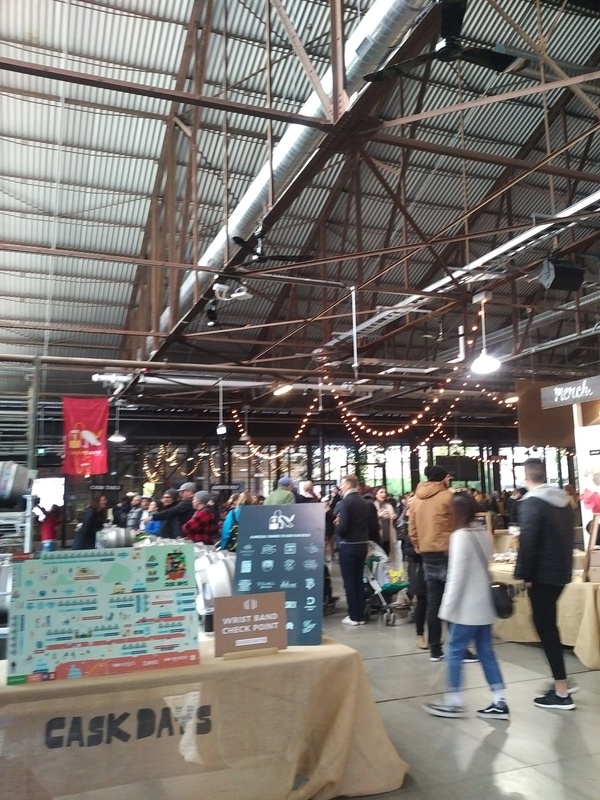 The atmosphere of milling about a semi-enclosed, exhibition-style structure had the flavour of the modern drinks festival. So too did the Canadian beer selections and related foods I described available at the brewers’ pavilion at Montreal’s Expo ’67. In our Part I, the essentially American quality of the first, 1859 national beer festival speaks for itself. It was advertised, barely 20 years after lager’s first appearance in America, to a general audience in an English-language newspaper that touted lager beer as an “institution”. No German ethnic references are written in the event advertisement. Just by virtue of offering drink brewed in Ireland and being attended by thousands of Irish and foreign visitors, it was destined to be more than a copy of the Munich Oktoberfest. Sadly, it expired in c.1973. This occurred, interestingly enough, because it was not Irish enough. Cited were its “questionable cultural credentials”, per this later Irish Times press report. The Campaign for Real Ale in England wasn’t inhibited by such mixed origins and goals. Its first festivals, from 1975, showed elements of the German beer fest but married to simple English food and great English beer. The novelty of helping cask beer survive provided an important indigenous element, to be sure. CAMRA in any case worked an important part of the craft fest revolution. The Irish can claim some credit nonetheless for influencing its form, via a path that took in the CAMRA festival – which had to be influenced by the Kilkenny example – and in their wake the first Great American Beer Festival in Denver in 1982. And, as I’ve shown, America and Canada had examples of a culturally non-specific beer festival before 1982 that resembled in many ways the modern craft festival. *This 1975 spring issue of the Advocate, an Irish-American weekly, indicates the Kilkenny beer Festival was still running that year, which would bring it into the early CAMRA era. **Another formative factor, operative too for CAMRA festivals, was the influence of homebrewers. This is another element in the “secularization” of the earlier, German-flavoured festivals. Beer festivals existed well before today’s countless large and small beer-tasting events. 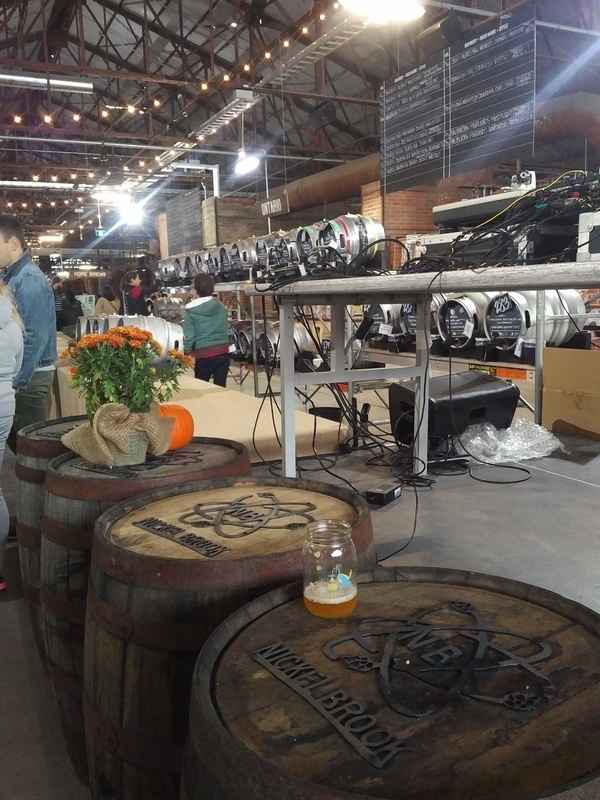 Excluding Germany, which has held them for centuries or more, modern beer festivals are often considered to start with the U.K.-based, Campaign for Real Ale’s early large-scale festivals. The debut was 1975 or 1977, depending how you interpret it, see here. In 1974, CAMRA held a small festival in Cambridge that is part of the history as well. For a literal glimpse of the 1975 event in Covent Garden, London, see this youtube clip. Any readers recognize themselves, or friends? But of course beer festivals outside the German lands have existed for much longer, by which I mean beer-sampling open to the public vs. industry beer exhibitions or expert panel judging. 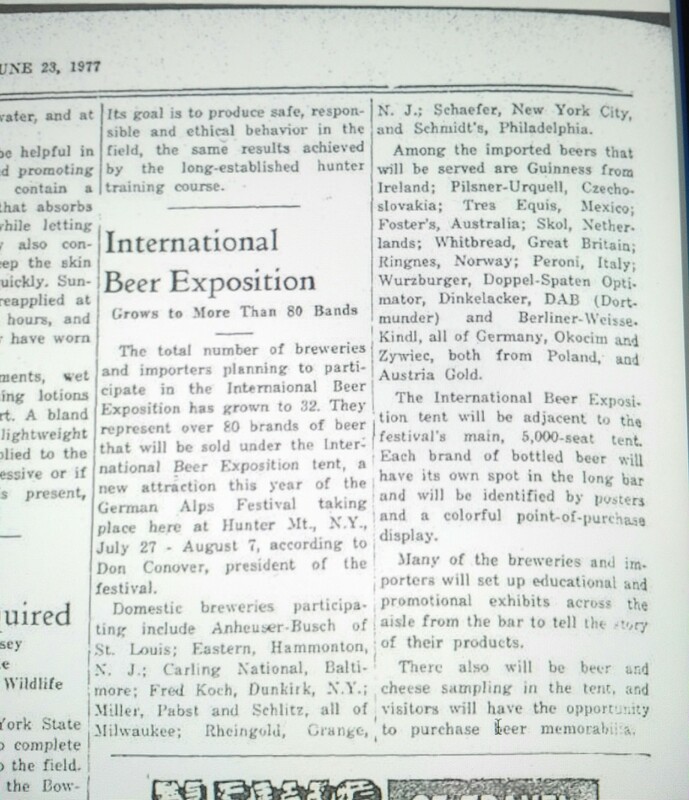 In 1977 a German-theme summer festival at Hunter Mountain, NY held its first International Beer Exposition. The number of beers tasted was impressive, rising to 146 beers in 1978. A glad prospect, then or now. Contemporary ads in New York from specialist retailers illustrate a choice of beers from Canada, Australia, Mexico, Britain, France, Germany, Belgium, Czechoslovavia, and other foreign countries with solid brewing traditions. Styles from weisse to IPA, from stingo to dark lager, from stout to Dortmunder, abounded. And of course America offered a range of beers from lights to “price” to premium to super-premium. It wasn’t all dross by any means. 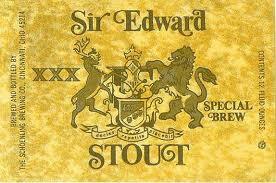 Sir Edward Stout, anyone (from Cincinnati’s Schoenling)? In 1969 in Kitchener, ON the first city-wide beer festival took place associated to the city’s now-highly popular Oktoberfest. This historical sketch of Kitchener’s Oktoberfest, prepared by the officiating organization, gives details. A black-and-white snapshot shows citizens drinking from incongruous-looking stubby bottles. While craft beer is available at some of the tents today, the Kitchener Oktoberfest values beer in a way largely separate from the craft ethos, or so it strikes me. None of this has impeded its great popularity. In 1968 in Australia, a two-day beer fest was held in Victoria by the Beer Appreciation Society of Australia (BASA). It was attended by a generally older crowd wearing business and formal attire. A good account is available via this video clip. Attendees laid stress on drinking for enjoyment, not to get drunk. This shows the novelty of the exercise then. In interviews, attendees point out beer should be appreciated for different attributes: flavour, body, a sour or sweet note, a bitter one. More than one pinpointed regional differences in Australia’s brews. After a sip one chap says, “evidently not a Victoria brew” but it’s “quite pleasant”. Hard to tell if he was playing to the camera. Some vocabulary differed from today, two men refer to a beer’s “workability”, a positive attribute meaning perhaps it’s sessional, you can have a few. Imported beers were trialled as well. BASA continues to this day, judging by a quick online check. IRELAND’S first beer festival began in Kilkenny, when the first event in a week of special entertainments and sporting fixtures brought thousands of visitors to the city. The centre of attraction in the 20-acre festival park was, of course, the gigantic 2,000 seat marquee, where beer was served in German biergarten atmosphere with a band, specially flown from Munich, playing German drinking songs. The festival was opened by the cutting of a tape across the entrance to the six centuries old Kilkenny Castle. Mayor Thomas Delaney, P.C., performed the ceremony accompanied by Mr. William Pinnegan, chairman of the festival committee and Mr. Walter Smithwick. chairman and managing director of E. Smithwick and Sons, principal sponsors of the event. Mayor Delaney welcomed about 20,000 visitors from many parts of Ireland, Britain and the Continent. He was glad, he said, that Kilkenny had been selected as venue for the festival as it could boast of having Ireland’s oldest brewery. He added that he was also pleased that the festival would encourage Irish culture through music and dancing. Competitions in and around the city throughout the afternoon attracted large attendances and the biggest was at the “crazy football game” in aid of the Rehabilitation Institute. Spectators overflowed on to the pitch. Later reports in the same paper indicate that Guinness was a sponsor. It is obvious – or shall I say obvious to me – that this event, which ran between 1964 and 1973, had an influence on CAMRA beer festivals. Things don’t come out of nowhere. This particular festival is of interest in that it did not directly issue from German ethnic social customs. I mean this in the sense that there is no long-established German community in Kilkenny whose cultural celebrations mutated into wider form, as occurred in Kitchener, ON (name changed from Berlin during WW I). At the same time, the Munich Oktoberfest influenced the form of the Irish affair, at least initially, as this press account states. The Great American Beer Festival emerged in the early 1980s and established henceforward the “craft beer festival” format. Before that, American beer fests were typically outgrowths of German-American cultural practices. Still, there had been some indications of a broader, “American” character. A good example is the “First Annual American Beer Exposition” held in – wait for it – 1933 in Cleveland, OH. It gathered beers from different regions and internationally for a large-scale public festival, not specifically of German character. It was set to run during the first week of July. Breweries were so pressed to make regular deliveries in the wake of beer’s legalization that the festival was postponed to September of the same year. It was a resounding success. Here is one of the early news reports, which gives some sense of the excitement elicited. The idea was to introduce beer in general to an avid, post-Prohibition audience. In many ways, it was the pre-Pro equivalent of what CAMRA did and Great American Beer Festival did in their early years, for their era. I believe the Cleveland event did not continue past 1933. The onset of the Dirty Thirties may have quelled the idea and/or the appearance of the Nazi regime in Germany. Beer in America was long associated with Germany and German social mores. Mounting a beer event in America of noticeable scale, while Hitler was ranting and persecuting, would not have been well-received by public opinion. Earlier, I found details of the “great” 1877 New York lager tasting, and described it here. I’ll mention one more, important because it is almost certainly the truly first national American beer festival. It has not been cited to my knowledge previously with one exception, mentioned below. It may seem surprising that the first national lager beer tasting – beers from north, east, south, west – was organized in Richmond, a southern city in what would soon be a Rebel state. However, lager was shipped to Richmond throughout the 1850s and people evidently acquired a liking for it. 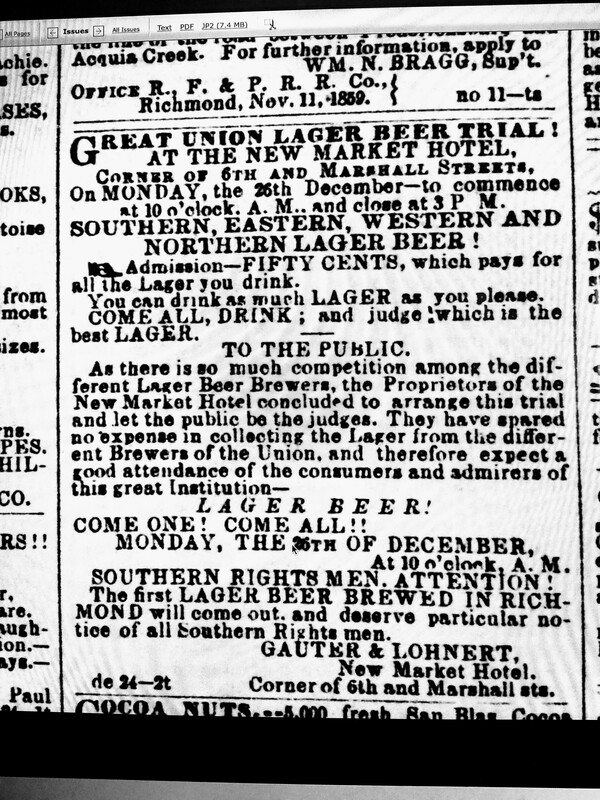 Richmond finally established its own lager breweries, the first of which, apparently Goodman & Richter, debuted at the event on Boxing Day, 1859. 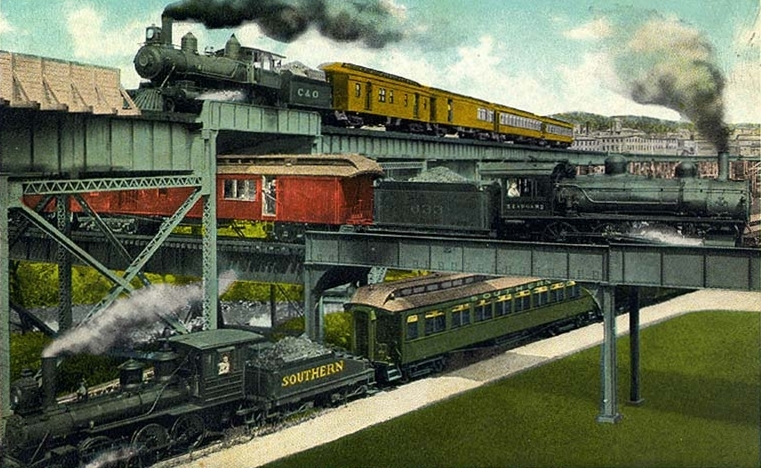 Richmond had an increasingly sophisticated water-and-rail transport system on the eve of the Civil War. This facilitated clearly the audacious plan to gather American lagers for a national tasting. The Daily Dispatch ad is referred to in Lee Graves’ useful 2014 study, Richmond Beer: a History of Brewing in the River City. He focuses on the event’s significance to Richmond brewing history rather than the broader implications, which makes sense given the scope of the book. But make no mistake: Richmond’s Great Lager Beer Trial was groundbreaking. It helped establish a tradition that, but for occasional temperance laws, National Prohibition, Depression, and war, made a permanent mark on American gastronomic customs. It is especially significant as it comes only 20 years after lager is first brewed in America. Everything comes from somewhere, again. The above is a conspectus – I could write the proverbial book, in other words. But it will serve to tell a story. Note: Part II follows, here. Note re images: the quotation and images above are drawn from the links respectively provided in the text. All intellectual property therein belongs solely to their lawful owners, as applicable. Images used for educational and historical purposes. All feedback welcomed. 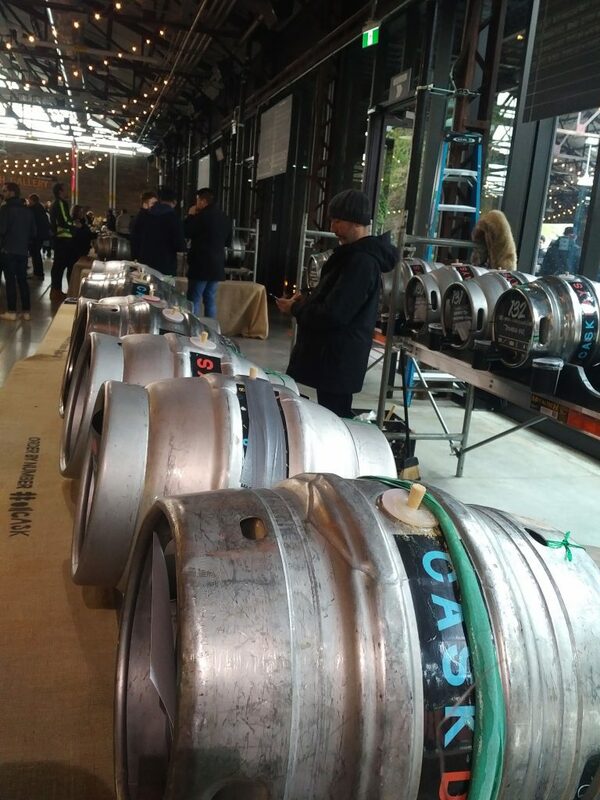 The Toronto Cask Days beer festival, organized by beer hospitality experts the Morana family, has just completed its 14th-edition in Toronto. We attended two of the four sessions, the opener on Friday and closing session yesterday. The festival is one of the largest of its kind in the world, held in the atmospheric Brickworks, a long-disused brick manufacturing plant in the Don Valley. It’s the perfect location for such an event. The unenclosed, gracefully aging work places, with antique machinery and kilns fixed in place, mingle perfectly with the lush greenery surrounding. 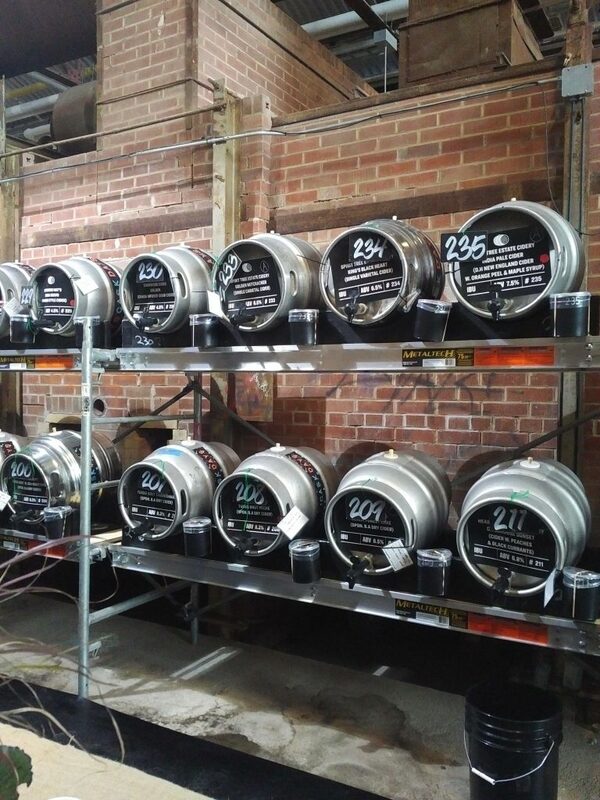 The event features mostly beers in the cask or real ale style. It’s a method of dispensing beer long-associated with Britain but all beer originally was stored and served in a similar fashion, before refrigeration, filtration, and gas pressure emerged. All casks are set on “stillages”, or frames, spiled with thin porous pegs to control the carbonation, and tapped by a hand-turned valve, the old-fashioned way. The method precedes even the Victorian handpump system often associated with cask ale. A small but good selection of regular (pressure-drawn) draft beer was also offered and various bottled exotica, making the selection over 400 beers in total. There were beers from Ontario, Quebec, New York, Maine, Pennsylvania, Oregon, and California. Add to this a good range of Ontario ciders, a cocktails selection with craft spirits, and even a wine stand, the bibulous or curious could hardly be disappointed. Virtually every style of beer currently offered in craft brewing world-wide was represented. Of the hundreds of selections, we tasted perhaps 30 as our approach is to sip a little and then discard the contents to try more. The cost can add up, but it is the only way to get a sense of the range there without getting snookered by the alcohol. Our favourite beer was a British Columbia Extra Special Bitter from the skillful Driftwood, due to its full, English-styled flavour. The beer actually uses North American hops according to the brewery’s description but they are used in a way that has an English effect. One of the hops is Amarillo, which I’ve said before has an orangey, English stamp to it. We liked as well a couple of double IPAs from California and a 12% abv Fred barley wine from Hair of the Dog in Oregon. A Barrier IPA from the New York City area, a collaboration with another New York brewery, also impressed with its well-knitted but strong American hop flavours. I liked too Amsterdam Brewery’s ironically-named Bad Life Decisions IPA, made right here in town of course, and a pumpkin ale with lactose, one of the home-brewing group offered. The features surrounding the main event – DJs, Arcade machines, food selection, were excellent and all went smoothly. Even the music level seemed perfect for the space and buzz needed. The full attendance was enhanced with travel packages offered, see this description of the amenities from the website. This year too an information booth was set up, to guide on beer styles, staffed by the knowledgeable Lauren Richard, well-known in the Toronto beer community. A couple of educational seminars were included as well. Almost all the beers I had were in good condition. Real ale is famously fragile in nature, and shipping such beer across continents is not without risk. None was out-and-out bad. One or two, from California and from New York, had an edge of sourness that seemed atypical but then too as sour beers are prevalent as a style today, few would have noticed. As for anyone, we stick to what we like, which meant swaths of beers not broached, mainly saisons, flavoured beers, sours, and barrel-aged beers. Still, there was lots to try in the parts we do like: pale ales, IPAs (regular, double, black, etc. ), bitter and strong bitter, porter and stout in various strengths, strong ales, Scottish-style beers, brown ales, and various lagers. If I have one cavil, and it’s not directed to Cask Days since they select what is currently available and popular, it’s that too many of the porters and stouts were flavoured: with coffee, plant extracts, herbs, fruits, cocoa of some kind, you name it. In fact most seemed to be, and/or barrel-aged with its coconut-like aftertaste. I like these beers unadorned, as the styles originally were. I still found some of course, but none, I might add, that really stood out in the way, say, Fuller’s Imperial Stout does. (We are not fans of the rose petal addition in this beer, like why? But it is barely if at all detectable, a good move by the brewery IMO). Later this week I’ll look into some North American beer festival history. It’s too easy to think that the early (1980s) Great American Beer Festivals in Denver, CO inaugurated the beer festival on this side of the Atlantic. In fact, the first national American beer festival was held before the American Civil War. After that I return to the late Irish writer Charles Duff, and explore his views on 1950s English pubs. This time, in regard to Duff, we take a deeper look, one that examines how such “pub guide/drink tourism” could even be written at the time. It wasn’t that much earlier that to write publicly of such things was at best viewed as eccentric, at worst as unrespectable. 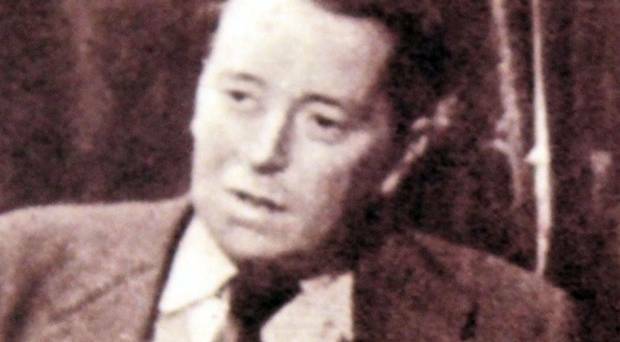 Charles Duff was an Irish writer of the mid-20th century. While largely forgotten today, an attempt has been made to revive interest in his work. The Ulster History Circle unveiled a blue plaque this year to honour his achievements, as explained 10 months ago in the Belfast Telegraph. Mr Duff, described by the Ulster History Circle as a “largely forgotten son of Enniskillen”, died in 1966. Its chairman Chris Spurr said: “Charles Duff has a different and distinctive profile as an author, to two other Irish writers already commemorated by blue plaques in Enniskillen, Oscar Wilde and Samuel Beckett. Duff shared with Wilde and Beckett a Protestant background, and may be described with them as Anglo-Irish unless this foreign observer mistakes the terminology. That being said, Duff had a deep interest in all corners of Ireland, north and south, and authored a travel book in 1953 called Ireland and the Irish. He wrote a similar book about England, and also covered what can only be described as an eclectic range of subjects. This took in language instruction (he was multilingual, having mastered six or seven tongues), capital punishment (he campaigned against it), Spain under Franco, social satire, and much else. His career path can be described as wayward: after a limited education he entered the merchant marine, was a soldier in France (WW I) and gassed for his trouble, and, before turning to writing, ended his conventional careers in the Foreign Office and the Bar – he qualified as a barrister, I mean. This diverse background seems to have opened his mind to many interests and influences; or perhaps it was the reverse that was true. In his Ireland book he devotes some good thinking to the pub, which I’ll turn to in a moment. It is noteworthy as one of the few reflective considerations on the subject to be made, seemingly, in the mid-1900s, versus the journalistic notations from the American press I discussed in my last post. I’ve looked at a half-dozen histories or accounts of the Irish pub, some academic, and none cite Duff. I’d think this is down to his obscurity today, but perhaps too his Ulster background? Duff was not a trained scholar, and was autodidact in many fields. Hence, his work retains a popular feel. For lack of a better term, it “relates” to actual social life more palpably than much scholarly writing, which typically serves different, certainly valid, goals. I can summarize his views in this fashion: the pub was an important social centre in Irish life on both sides of the partition line. Northern and Southern pubs shared many traits except that Ulster pubs tended more to resemble English ones. The Republic’s pubs, in contrast, could show unique features such as absence of the pub tie, cheaper prices, and sharing the business of selling drink with grocery and other functions. The so-called “spirit-grocery”, which seminal beer author Michael Jackson had noted carefully and illustrated with photographs in his 1977 The World Guide to Beer, was a common feature especially in rural areas. Perhaps it still is today – others can testify more accurately to this. Duff stresses as well that the pub of the Irish everyman expressed its most authentic character. Pubs frequented by the more prosperous classes were more restrained in character, more inhibited we would say today. In this respect, unlike the Irish observer of some 20 years later who found pub denizens rather dull (see my last post), Duff found them “interesting” and “congenial”. Both in this book and other writings, Duff made it clear he sympathized with Irish independence, not perhaps extending to island unification, but in regard to the 1922 treaty with Britain and membership in the Commonwealth. He recognized the deformations in the Irish economy and psyche that English diktat had entailed for so long. He was no socialist, but seemed a liberal democrat who realized that British empire had reached its terminal point by the early 20th-century. He saw it was futile to resist the impulse of subject lands to self-government, and deprecated in particular British handling of the Easter Rebellion. At the same time, while he puts it diplomatically, he thought it best that for the time being and barring an unusual event, Ireland should stay divided. Duff puts great emphasis on the deterioration in his view of the design ethic of pubs in the Republic. Elsewhere in the book he cites the Davy Byrnes pub as an object lesson. He was particularly against the excessive use of chrome for decor and fittings, and said the pub’s 1940s renovation evoked a hygienic American film set. He preferred the simple wood tables and chairs of Joyce’s Dubliners era. Again diplomatically, he states that Ulster pubs resisted the worst effects of this trend. Nor did he confine the decline to Dublin, as he makes clear similar “improvements” existed in places like Cork. In general he regarded Dublin as more coldly efficient than Ulster even in the early 1950s, which strikes one as counter-intuitive today. Perhaps everyone regards the physical structures familiar in their youth as inherently superior to today’s architectural fashions. I still like the concrete bunker or “Brutalist” design of many public and private buildings in the 1970s. Was that better than today’s, er, polished metal and glossy glass? Not really, but it’s what I remember in a formative time of my life. Young people discovering bars and pubs in 1953 Ireland were probably less enamoured of the dusky wood and brass of c.1900 Dublin than Duff, almost 60 by then. After all, the Edwardian period was their dad’s or gran-dad’s era. Anyway, Duff knew how to write, so I’ll let him argue the matter in his way (pages via HathiTrust). Note re images: the images above are drawn from the links identified and stated in the text. All intellectual property therein belongs solely to their lawful owners, as applicable. Images used for educational and historical purposes. All feedback welcomed. I’ve proposed a distinction between early Irish pubs in North America, founded by new arrivals or continued by progeny, and a later, more Americanized version. This history of Chicago Irish pubs by Ilison Hantschel will assist those seeking to understand the immigrant wellsprings of the American Irish pub. This 1961 column by a Jewish writer, Harry Golden, spotlights early Irish bars on the Upper West side, Manhattan, that had mostly disappeared even by then. The later, Mark II version may have been started by someone of no Irish background, or who purchased a pub from Irish-Americans, or maybe too an Irish-American long assimilated, perhaps one who made a sentimental trip to the Free State. A third stage arrived with the onset, c.1990, of the Irish Pub Concept, of which the Dublin architect and designer Mel McNally in concert with Guinness/Diageo was a principal mover. 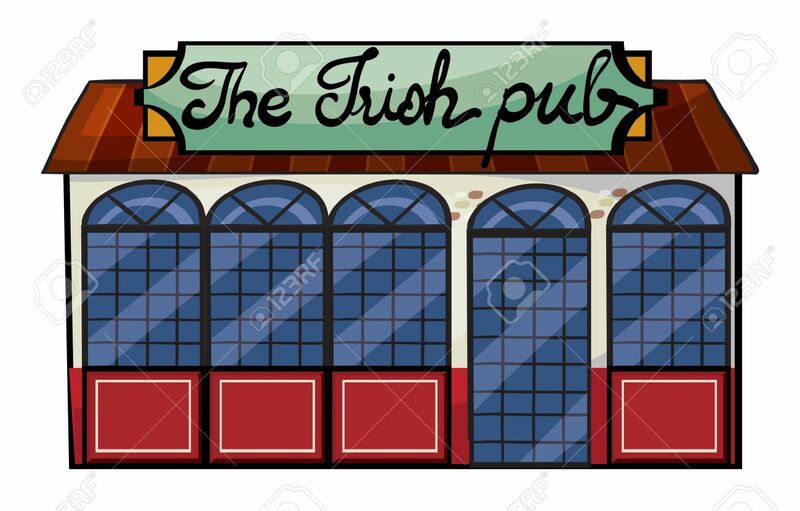 McNally in this youtube clip from 2011 gives an excellent overview of the goals of IPC and methods by which corporate organization exported thousands Irish pub interiors around the world. (Diageo has no commercial ties today to IPC but evidently still has a good relationship with it. McNally remains active in the venture some 40 years after first studying, as a student project, the design characteristics of pubs in his homeland). A fourth stage of Irish or Celtic pub is the craft version, of which a number exists in Toronto, say Dora Keogh, Céilí Cottage, and Stout. Indeed we have examples of pubs in all four classes, and I enjoy examples of each. A good pub is down to the actual experience, which can’t be defined in advance, for any food or drinking place. The categories are fluid to a degree, and suggested for convenience, but broadly hold in my estimation. This is based not just on considerable reading and reflection but practical experience in Toronto, Montreal, New York, London, Paris, and elsewhere – latterly Kitchener, ON. Condon was a regular letter-writer in the Advocate. He must have been about 60 and I’d guess a retired transport or other worker. He mentions in one letter having worked on Manhattan subway construction in 1936. He had definite views on Irish politics – staunchly nationalist – on pubs, and beer, evidently, recalling how bottled Guinness (i.e., Foreign Extra Stout) was served in Manhattan in the 30s. The Advocate printed many articles on Irish history and culture. At least in the 1950s – 1970s, the period covered by my review, it didn’t take a strong stance on unification. Nonetheless many of its readers were strongly nationalist or at least demonstrated a resolute ethnic pride. Condon’s letter is an illustration. You can’t blame him in one sense, as into the 1970s at least, a close connection with an ethnic pub entailed knowing its owner well who was a key part of the social network. Condon felt more at home with an owner of his background, and expressed that sentiment in his letter. Times change, and concepts of ethnicity and citizenship with them, so the letter has an old-fashioned ring. 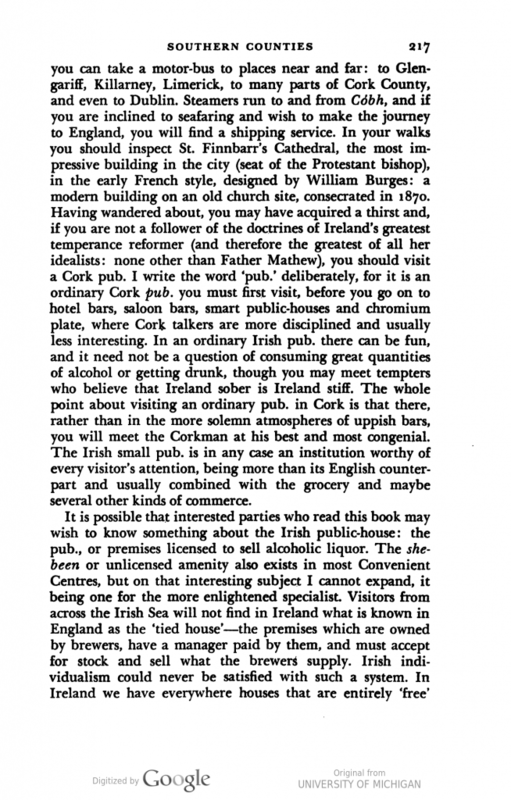 The Advocate reported regularly on the pubs of Ireland, the model for the bars Condon admired. Most of the articles were complimentary and often quite funny. One describes a group of customers being surprised by an itinerant vendor who announces, “Gentlemen, ye are about to witness the return of the old-fashioned top”. He entrances them by jigging on a spinning top, appealing to their memories “as childer”. In the process he unloads not a few of the toys on their gladdened souls. The writer remarks: the jar the next night foregone. Tom Kelly blasted out his own version of ‘If I were a Blackbird’. It’s a good job that Tom isn’t a blackbird because if so it would be too bad for the Queen of England when he flew over her. What I like most about the Irish pub is the uncertainty of it. First of all, though you know to the minute what the opening time will be, when it comes to the closing time you could find your calculations out as much as an hour or for that matter much more. But not all the treatments were adoring/affectionate. This 1970 piece by a correspondent born and bred in Dublin offered a more nuanced, even dissenting, view. He deprecated the tendency to romanticize and elevate the Irish pub beyond its just place in the scheme of Irish culture. Not only that, he offered the opinion that in general, New York Irish pubs were superior. (No doubt a safer proposition than if offered verbally in an Irish bar either side of the sea). He does, however, try in an Irish fashion to refute the false notion – that Dublin pubs are full of playwrights, artists and the like – whose de­light in life is – to sell his bill of goods to the visitor, and I must admit – whatever the fash­ion – in this he is sincere. For the Dublin pub is indeed over­rated both as to clientele and the establishment itself. The clien­tele is invariably quite dull, un­less inebriated and the establish­ments – though perhaps semi-historic is not of the historic nature that a nation would seek to preserve. Yet the average visitor, es­pecially the Americans, seem far more interested in the Irish pubs than in the Irish culture. Another thing notable in the pub reports whether by Irish or American correspondents is the relative lack of interest in beer as such. 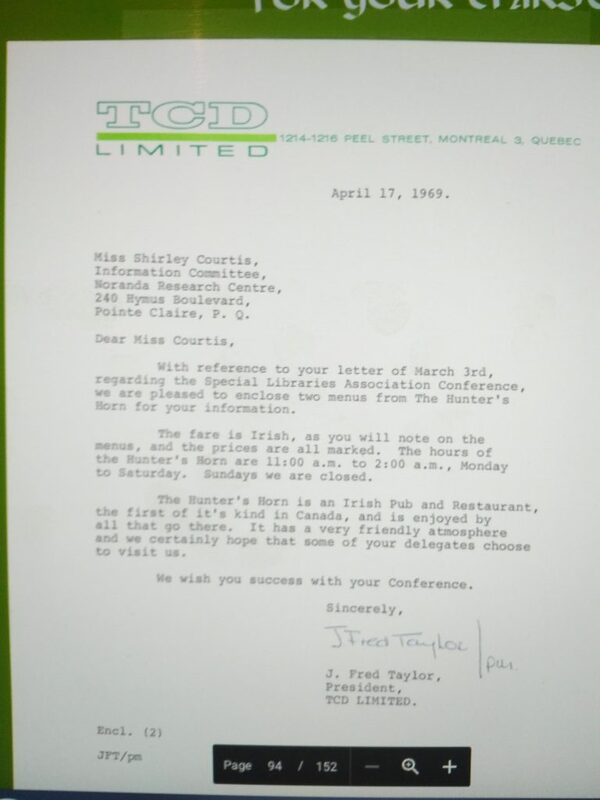 To be sure Guinness’s activities and sometimes those of other breweries were chronicled, for example when Harp lager was launched in 1960, or when Guinness staff went on strike in the early 70s. But apart from noting regularly the founding year of Guinness, there was little interest in porter and stout as drinks: their origins, their changes over the years, nothing of that order. Guinness was respected as a strong emblem of Ireland; that was enough and there was no need to deconstruct the drink as became usual after international beer writing started in from about 1975. It’s all good, to use a non-Irish expression. (Or it was). Little was said in the Advocate of Irish whiskey except to note sometimes in the pub you could get a “half-one”, I assume a small drink vs. a double. * Today no touristic coverage of Ireland is complete without a charge into the distilleries old and new. Inevitably the visitor rhapsodizes over a style, single malt Irish, that isn’t particularly Irish to begin with. I think at bottom this means, the Irish themselves and their wiser relations overseas have always been pragmatic about the country. If building pub interiors for the world gave jobs to Irish workers and contributed to a benign image for Eire, all the better. If chilled lager, or single malt whiskey, ended by pleasing the Irish equally or more to stout or the old single pot still whiskey, bring them on. All countries are like this in their organic development, and will refuse to be pigeon-holed except, of course, where it might be to their advantage. The development of tourism has perhaps had this effect in Ireland. But so too has it in England, Scotland, Canada, San Francisco, Venice, and … where has it not? North Korea, maybe, but that’s no recommendation. Note re images: the images and quotation above are from the Fulton History newspaper archive, with source for each linked in the text. All intellectual property therein belongs solely to the lawful owner, as applicable. Images used for educational and historical purposes. All feedback welcomed. *I should qualify this to state that there are numerous articles in the Advocate from the early 1950s addressing whether Irish distillers should attempt the U.S. market, where they had almost no sales at the time. One solution recommended to them was to blend their straight pot still whisky, to lighten it in the fashion of blended Scotch, but they (commendably) resisted. Today the major regular brands of Irish whiskey are blended – Jameson, Powers and the like, but such blending only came in in the late-1970s. I meant in the text that as for beer, comment is rarely offered (that I found) by the consumer on whiskey choice in Ireland, comparative flavours, ways of serving, etc. 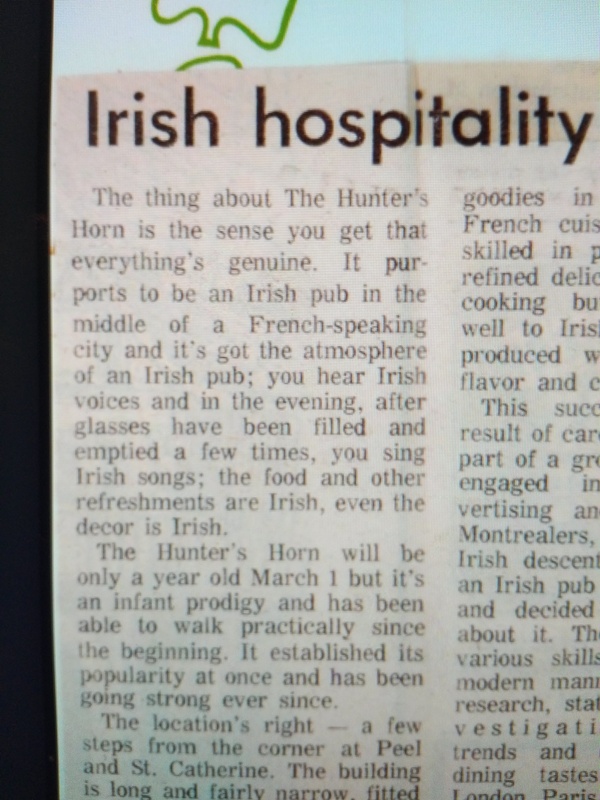 The question of the expansion of the Irish pub internationally has captured the attention of the general media (e.g., New York Times, 1976), beer media, academics (see e.g., Kevin Martin’s stimulating Irish pub history), and everything in between. This Thrillist piece from 2014 by Dave Infante is illustrative of the beer/food/travel press approach. My interest initially was not so much the “Irish pub” in North America, but the first appearance of nitrogen-dispense draft Guinness. I mean, the form of draught Guinness that replaced naturally-conditioned Guinness, or real ale if you will, from about 1961 in Ireland. Still, it is impossible to separate meaningfully the two questions, so I discuss both here. To my knowledge, no one has pinned down the first appearance Stateside of modern Guinness draft, so I’ll step in. It was in 1965, in St. Louis, Missouri. For three years beginning Sept.13th draught Guinness will be sold in Famous-Barr, well known St. Louis, Missouri department store. This will be the first time Guin­ness is sold on draught in the U.S. If the experiment proves successful, it will be introduced in other parts of the country where bottled Guinness is now sold. A special Irish pub, now being built on the second floor of the well known store as part of a store-wide Irish promotion, will serve the famous stout. The draught Guinness and the dis­pensing equipment in a unique Guin­ness design are being shipped es­pecially from Dublin, the stout being contained in special casks. Harp Lager beer, Guinness’s only other product, first brewed by the 206-year-old Guinness in 1960, will be on sale in the bar, as well as in the sixth floor restaurant, where Guinness will also be sold in the bottle. At first blush, why St. Louis, and not New York, or Boston? I think Guinness was cautious, chastened by the failure of its American branch brewery in 1949-1954. Rather than test its new “widget” dispense in New York or Boston, it elected a Midwest location. It’s a frequent gambit, too, of marketers to choose a regional location for a new launch. At the same time, St. Louis has always had a strong Irish component, so that didn’t hurt. That St. Louis was centre of the Anheuser-Busch empire was probably coincidental, as all American cities then were dominated by the light adjunct lager style. There was no “dawk” to the Buschs, in other words, except in the sense of finding a good beer town to deploy the black stuff. 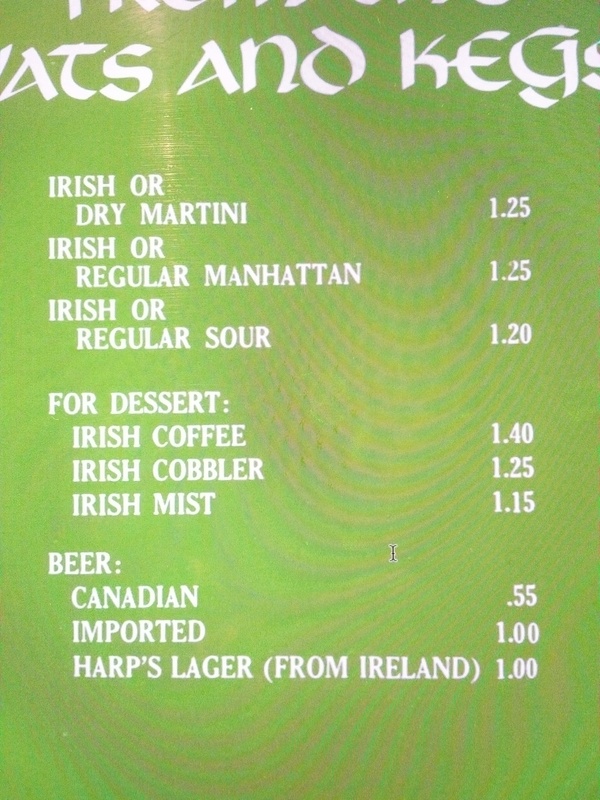 An additional point I’d make is, before the post-1990 era of design, construction, and world-wide shipment of Irish pubs, now commodified by large business, the Irish pub was far from a cipher. That is, it was a real, living thing in Irish expat communities and American ones still marked by Hibernian culture through the generations. This is evident from reading issues of the Advocate in the 1960s-1970s. They attest to the close link between Irish-Americans, pubs owned by them that advertised in its pages, and indeed Guinness Brewery, whose various doings are chronicled carefully, whether in Ireland or here. This included the launch in 1960 of Harp lager, which received no little attention in its pages. In a word, the Irish pub before the nouvelle vague was genuine and nourished an authentic, living community. The pubs were built in North America and poured, before draft Guinness was available, the taps of the locality. They were no less Irish for that because what made them Irish was the people. That said, from the early 1960s on in North America and elsewhere outside Ireland, the Irish pub’s packaging and commercialization had started. 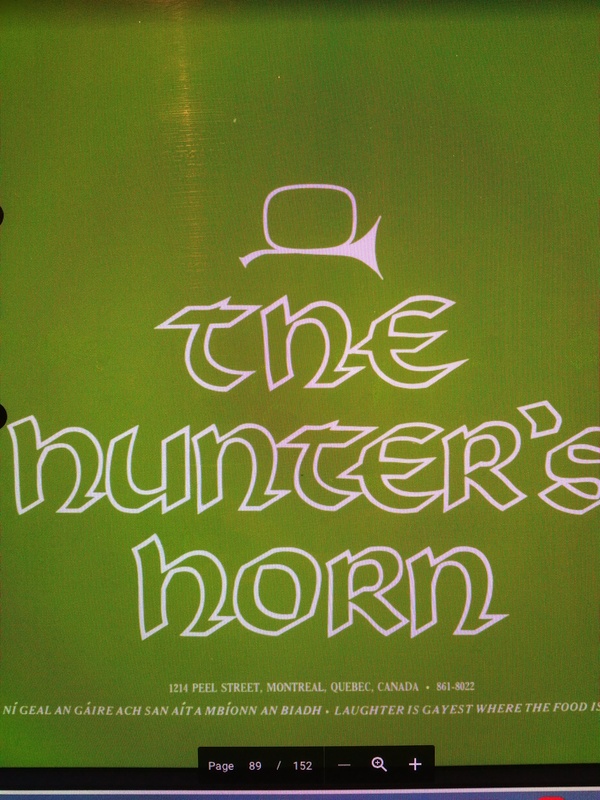 The Hunter’s Horn pub in 1960s Montreal is surely an example. Shown are extracts from its menu and related documents now in the archives of Montreal’s McCord Museum. 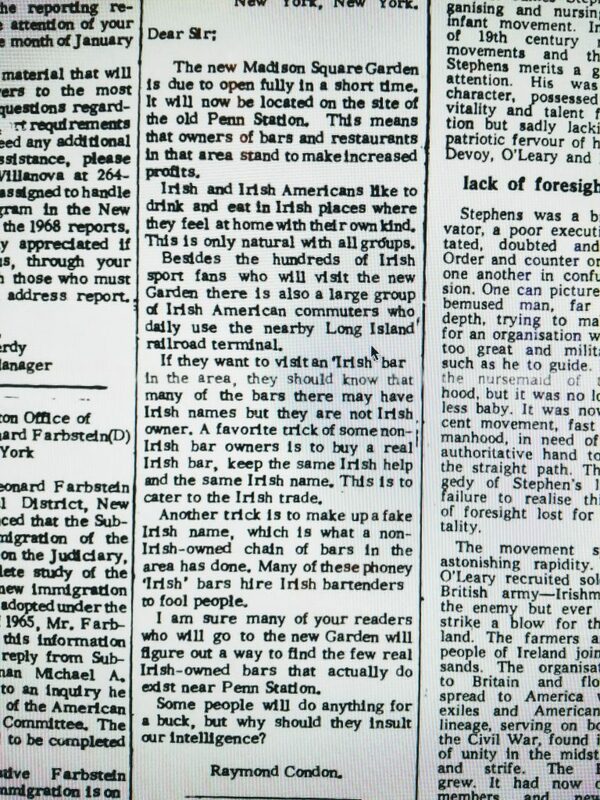 This development was not, I infer, simply an organic outgrowth of an Irish-American community. Hence, one can probably identify four stages of Irish pub in North America. First, the one referred to by Infante where immigrant Irishmen put up their sign on a pub otherwise local in design and atmosphere (yet he doesn’t in my opinion credit them with enough Irishness). The famed McSorley’s Old Ale House is a good example in New York, but there were and still are thousands more including in Toronto. Second, there is the 1960-1990 semi-commercialized Irish pub, perhaps appearing initially at a world exhibition, or simply the vision of an astute businessperson. The English pub with its early decor of red phone booth, flock wallpaper, and banquettes was a similar, and parallel phenomenon. Third, there was the brilliant turn-key concept pioneered from 1990 by Guinness/Diageo and their numerous competitors, as chronicled by Infante. The result was thousands of Irish pubs from Paris to Peking. Last, there is the craft emulation of the Irish pub, of which the always-uplifting Allen’s in Toronto and Dora Keogh bar adjacent, are pioneers in Ontario at least. In other words, the vision of one person, not a planning team, and focused more on craft beers and fine whiskeys than the average “corporate” pub. It’s all grist for further reflection and study, it really is. Some of the academic writers observe for example that music sessions in Irish pubs, indelibly part of the genre today from Dublin to Dubai, were a 1960s development, in part sparked by the American folk revival. N.B. Of course draught Guinness, the pre-nitro kind, was widely available in America before Prohibition. 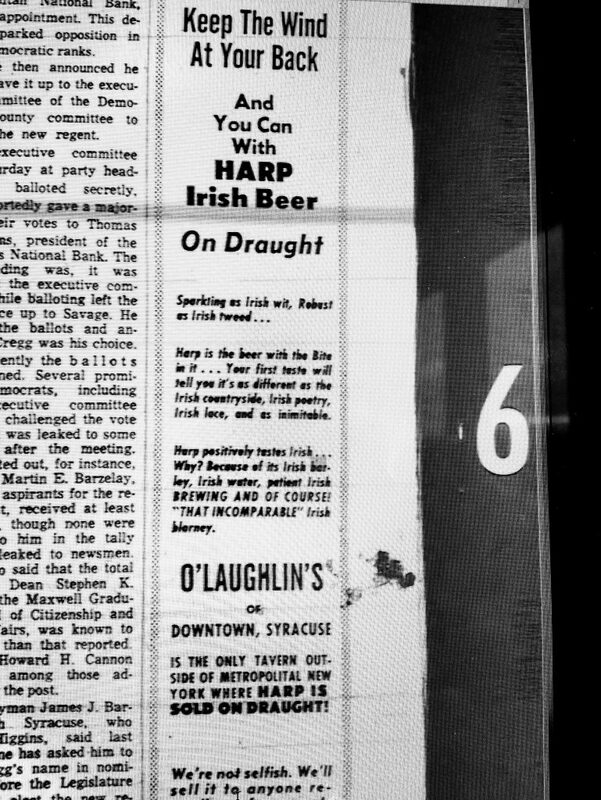 The 1965 Advocate piece didn’t mention that, if the journalist even knew it, but anyway the context was the first draft Guinness in the U.S. in recent memory, and post-Prohibition. *Or rather, another one, as a few already exist.